Lately, I’ve been thinking about how to setup a development workspace to tinker with Illumos builds as they come rolling hot off github. Ideally, I’d prefer to code on my laptop (macbook), build on my server (orion), and test on a virtual system (oi-dev-box). Luckily, being mostly finished with our big move westward has afforded me some time to sit down and play with Illumos again. I’ve been using OpenIndiana KVM for a little while now as my primary hyperviser at home and I’ve been very pleased with its ease of use and stability. (You know you’re a nerd if you ever use the phrase “primary hyperviser at home” seriously.) I used to run systems in VirtualBox but the overhead associated with VirtualBox VMs was a little annoying. KVM + ZFS is quick and I don’t have to bother with a lot of the VirtualBox-isms to manipulate and test simple VMs. Yesterday, I browsed over to the Illumos build document to see if much had changed since the last time I logged in. I have to say, “Wow!” What a difference a few months makes. The build document now contains an excellent write up on how to build Illumos on one system and test it on a different system. This is a much easier method to test with than building on a local system, applying the update with onu, and rebooting. Especially if you’re like me and your build server is the fastest machine in the house and you’ve got it doing more things than just building Illumos. [Orion] Clone Illumos source tree from github with git. [Orion] Create an experimental branch on the build machine’s Illumos git repository. [Macbook] Clone the experimental branch from the build server to the laptop. [Macbook] Push the Illumos source back into the build system. [Orion] Make sure the package depot for your build is functional. [OI-dev-box] Update with your latest changes. I know that seems like a lot to create a build environment but much of it is only setup that just needs to be done once. The actual workflow goes much faster once you’re familiar with the tools and process. So, lets tackle each one of these points separately. 1. [Orion] Clone Illumos source tree from github with git. This one is easy to take care of. Simply download the Illumos source to a system you’re going to build with. The Illumos build document has more information on how to prep and configure a machine to build Illumos. 2. [Orion] Create an experimental branch on the build machine’s Illumos git repository. 3. [Macbook] Clone the experimental branch from the build server to the laptop. 4. [Macbook] Edit Illumos source. 5. [Macbook] Push the Illumos source back into the build system. Now you need to add your modification to your repositories’ staged changes, check the status of the change, commit the change, and push it into your build machine. The change has now been pushed into your build system on the experimental branch. To verify, log into your build machine and make sure you’re in the experimental branch. Hopefully, your modification made it over to the build server. Now it’s time to build Illumos and test the change on a VM. 6. [Orion] Build the source. I’m not going to go over setting up a build system for Illumos since the process is well documented in the Illumos build document. You’ll want to make sure you’re on the experimental branch of the build system’s Illumos repository before starting, however. 7. [Orion] Make sure the package depot for your build is functional. The Illumos build process packages the files you just compiled and linked into IPS images. These images are then copied into a file repository on your build system. If you share this repository across a network, any system using Illumos and IPS can update from it. In this example, I started the depotd listener on port 8151 and named the repository on-nightly. 8. [OI-dev-box] Update with your latest changes. 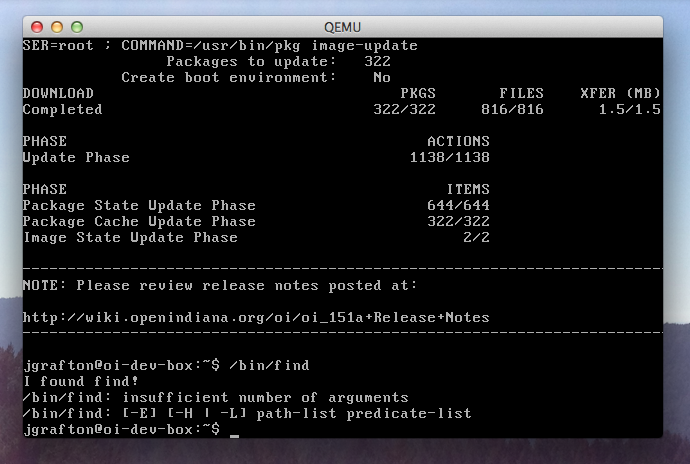 Now, update Illumos on the new boot environment! As long as you’re using this boot environment in your VM, you don’t have to follow all the steps above every time you want to make a change to your Illumos source. You only need to push the changes into your build machine, rebuild, and run pkg image-update on the VM. This blog post will probably be updated in the future as I learn new ways to improve my development process. Let me know if you have any trouble or questions with this process by either leaving comments or tweets at @Graftolistic. This entry was posted in computers, development, illumos, openindiana. Bookmark the permalink.